Hey guys! 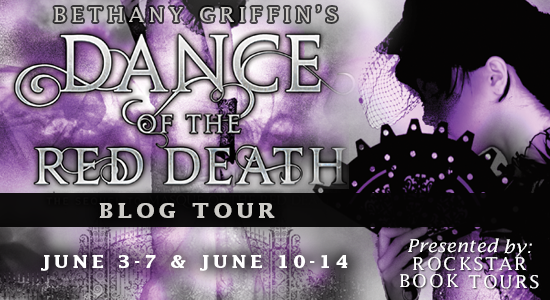 I'm so stoked to be the release day stop on the Dance of the Red Death blog tour today!! Since the moment I finished Masque of the Red Death, I’ve been craving the sequel. When I got the news that I was chosen to be on the tour and would get to read it in advance, I did an embarrassing happy dance around the room. I loved the writing and atmosphere of the first book so much (read about it here) and the ending was cruel! My expectations for the sequel were high, especially considering that it would conclude the series, and I’m happy to say that they were met, though not entirely in the way I had expected, which is a good thing in my book! You can read my review below, but first a little more info about the book and the author. Also, if you live in the US or Canada, don't miss the giveaway at the bottom! Bethany Griffin is a high school English teacher who prides herself on attracting creative misfits to elective classes like Young Adult Literature, Creative Writing, and Speculative Literature. She is the author of Handcuffs & MASQUE OF THE RED DEATH (April 2012). She lives with her family in Kentucky. Dance of the Red Death picks up right where Masque left off and is every bit as cruel and unflinching about the world it portrays as the first novel, all the while keeping alive that sliver of hope us readers barely dare to hold on to out of fear that it might be crushed. Because I’ve read roughly a hundred books since finishing Masque, it took me a moment to find my way into the world and the exact place in the story again, but once I got my head around it I was once more fully engulfed and invested. If it’s been a while since you finished the first book, you might want to skim over the last couple chapters again if you don’t want to flounder around in the beginning. I can’t say too much about the plot since it’s easy to spoil important points, but Dance begins with Araby’s group of sort-of-allies recovering out in the swamp outside the city and trying to fix up their airship while arguing about what to do next. Elliott wants to attack Prospero’s castle and return to the city a victorious hero, but Araby doesn’t believe that to be possible and thinks they should return right away. One reason for that is that April’s infection is getting worse, and Araby hopes that if they manage to find her father, he could have a cure. Araby has come a long way from the detached, oblivion-seeking girl she was at the beginning! Despite still being injured, she shows a spine of steel and is willing to face danger aware of the possible consequences. She wants to find and confront her father, and if possible find a way to atone for what he did. She wants to stop both plagues and put an end to Prospero’s reign. And, of course, she also has to figure out her complicated tangle of feelings towards Elliott and Will. Araby’s feelings for Elliott and Will are complex but she now knows better than to trust either one. What I loved about her arc was also her will to accomplish something on her own, without having to rely on either of the guys. She doesn’t have to love or choose either simply because they want her. I didn’t necessarily always agree with her actions and choices, but I understood why she made them. This love triangle, if it really is one, works for me because it’s layered and because all characters are really intriguing and the dynamics and shifts of power and influence between them fascinating! It’s never easy to say who’s in charge, who’s lying, who’s playing and manipulating whom. However, not only the core-trio of Araby, Will, and Elliott is evolving, also April shows traits I would not have expected in her, and we learn more about Prospero, Malcontent, and Araby’s parents. There are also a few minor characters I found very interesting. The pacing, as in the first book, is a slow, gradual build-up and I admit I was not quite sure where things were headed in the beginning. Thinking about it though, that makes sense considering the setting, the plague, the uncertainty, the chaos. Will Prospero seize power? Will Malcontent? Can Elliott succeed in dethroning his uncle, and if so, will that really make things any better? Will the only winner be the Red Death, in the end? Bethany Griffin sets up all the dominos in quiet deliberation, building up tension… then she lets them fall, and the plot unravels in twists and turns I never saw coming! As the end drew near, I was torn between craving to read fast to see what was happening and wanting to read slowly and savor the gorgeous prose and lush description. I love how E.A. Poe’s work is woven into the story this time. I feel that it’s much closer to his short story than the first book. There, it’s mostly the general mood and the idea of wearing masks, of a plague raging outside while the wealthy and beautiful feast in a seemingly closed-off, sheltered space. In Dance, a lot more elements are picked up on and built into the tale with a twist. I can’t reveal more because I don’t want to spoil it for you, but let’s just say you will get more of the last few chapter’s if you’ve read Poe’s Masque of the Red Death. As you can tell, Dance of the Red Death was fantastic to me. I loved the character and power dynamics, but above all the writing. Bethany Griffin knows how to craft an emotional punch into the simplest of sentences. She can make my heart clench with a single, well-placed cruel word. Much of the power of her language and of the emotions in the novel come from what is not said, what is implied between the lines or in gestures. I really like the way the story turned out, but I also feel bittersweet about the ending. I’m not ready to say goodbye, and at the same time, it’s a good place to leave things to the reader’s imagination. Regardless, I know that Araby, Will, Elliott, and April will haunt my mind for a long time to come, and I look forward to re-reading their adventures! - US / Canada only! 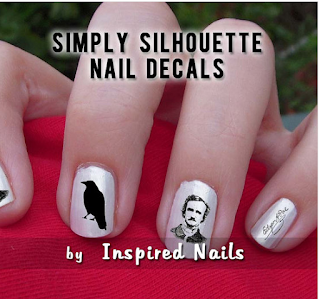 - Grand Prize- Poe Nail Decals, Masque of The Red Death inspired bracelet, Hardcover of Masque of the Red Death, bracelet, and a bookmark! 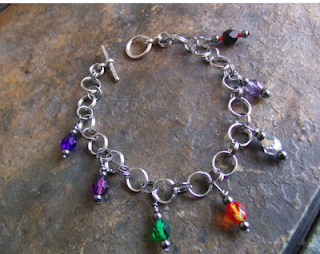 - 3 Hardcover of Masque of the Red Death, bracelet, and a bookmark! 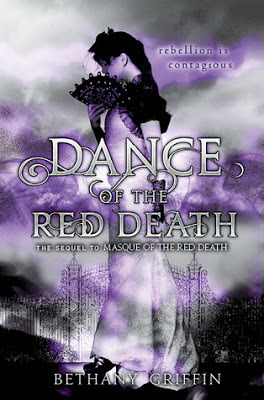 Have you guys read Masque of the Red Death? Are you excited about the sequel? What do you think of my review, or the general idea of the series? I'd love to hear from you! Also, check out the rest of the tour below - there are some great interviews and guest posts! I'd have to say The Tell Tale Heart for sure! It was the first one I read, and it stuck with me! Definitely The Tell Tale Heart. I saw this in the store today and hated walking away due to lack of funds. I loved the first book! I haven't read too much of Poe's writing, but Masque of the Red Death certainly stuck with me when I read it shortly before starting Griffin's first novel. Though The Raven will always be the one I remember most. I love The Raven too! Fall of the House of Usher is another favorite, so is William Wilson. I hope you'll be able to get to DotRD soon! I will have to say The Raven because I've been that's all I've read from him. Bittersweet pretty much nails it! And yes, I also loved how much more I'll-handle-this Araby was this time around! She's grown so much from the girl we first met in Masque! The Tell Tale Heart. Thanks. You should! They're both really good, and I like that the series is only two books - no half a dozen to catch up on :) I find that really refreshing for once! THis book is like everywhere. I've heard the buzz but i don't i'll like it. Huh, I thought for sure that I'd commented on your review of Dance before and was coming to check & confirm only to find that I didn't O.O Anyways, it's official: you've made me want to read Dance and I'd sworn after Masque that I had given up on the series - I just never connected with Araby (or Will or Elliot for that matter) and being the character reader that I am, despite how much I loved everything else, overall I couldn't invest. But reading that Poe and his story and better incorporated in this one and that Araby seems to have improved makes me want to finish this series!! It's only one more book after all hehe :) Thanks for the fab review doll! Sold. Araby is quite different though, and despite my dislike for Elliot (Will continued to be amazing) I was still happy with how the romance part turned out in the end. But I can see how the series isn't for everyone. Is it that good? I want to read it, but I haven't read the first book yet.